Chaos Wins! 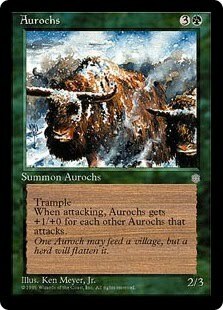 : Classic Tribal Wars: Aurochs! I occasionally play Magic Online in the casual room (you're welcome to guess my screen name) and make it a habit of playing Classic Tribal Wars when I do. It's far and away my favorite format since it offers a lot of cool variations on deck construction without becoming entirely degenerate. Not that I hate competitive magic mind you, but if I'm going to do that I'll stick to tournaments and the Standard or Draft queues. Classic Tribal Wars is not a perfect format. It still has a number of problem cards that I'd wish otherwise didn't exist (I'm looking at you Aether Vial). Regardless, despite some of the irritating elements of this format there is a lot of room for creativity. Today I present an outstanding example of this. I feature not Goblins nor Elves but rather Aurochs. Yes, I've created a cow deck. Aurochs are fun but not just because you get to kill your opponent with cows. They are fun because they are beefy (pun intended) creatures that can swing for a lot in larger numbers. One thing I wanted to accomplish was making sure they swing for as hard and as fast as possible. A great way to accomplish that is to make them hasted cows. Please see Fires of Yavimaya. Of course the rules of tribal enforce the deck to be 33% creatures of the same type. Since only 16 Aurochs exist we have to cheat. The Lorwyn changelings let us to do that. Woodland changeling isn't a great card, but it lets the deck exist in this format. I'll take it. Backing up the cows we have some mana acceleration and fix and some removal options. Jund Charm is a nice sweeper that also can be used as growth effect on our trampling cows. Maelstrom pulse (or Putrefy if you're on a budget) works well for permanent removal that we can't otherwise deal with. I like Nameless inversion for my spot removal since I can fetch it with Auroch's Herd if necessary. It also turns my Auroch's Herd into a ball lightning in a pinch. Pretty slick. So that's our cow level. Probably isn't going to beat goblins, but maybe on a good day. See you in the casual room. 0 Response to "Classic Tribal Wars: Aurochs!"